A group of mascots pose for a photo on the Friends Select school’s roof. How do you unveil a mascot just a little more than a month after the biggest mascot launch in world history? How do you do it when you’re a smaller team in the same city? 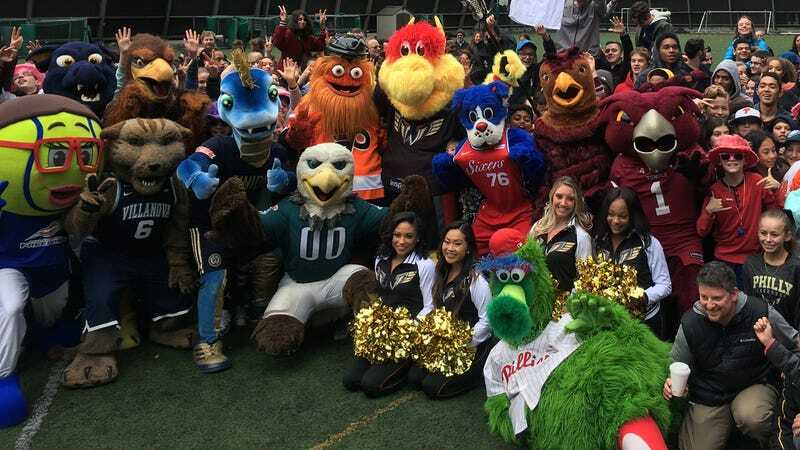 Well, you invite all of the city’s mascots and throw a mascot party, of course. But today the NLL’s Philadelphia Wings, a lacrosse team that returns to Philadelphia next month for the third time after a four-year hiatus, introduced the newest member of its team: Wingston, a furry yellow dragon whose head spins all the way around like Goldie Gopher. But also, Gritty was there. And the Phillie Phanatic and Swoop and Franklin and the St. Joe’s Hawk and Hooter the Owl and Will D. Cat and Mario the Magnificent—another dragon, for Drexel—and Nettie, a tennis ball–headed Billie Jean King lookalike. (Nettie is low-key one of the best mascots in sports.) The Wings event was held at Friends Select School in Center City, so the school’s falcon was there, too. But, mainly, people were interested in Gritty. Gritty Gritty Gritty. No offense to Wingston, but that’s who people wanted to see. There was a guy dressed like an agent from Men In Black who was acting as a handler for all the mascots, and he literally had to drag Gritty away from the adoring fans. 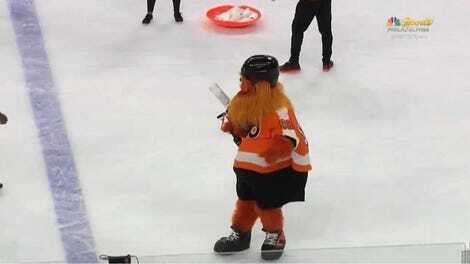 Even the Phillie Phanatic, the king of all Philly mascots, didn’t get as much attention as Gritty did today. Lindsey Masciangelo, vice president of business operations for the Wings, said she subscribed to the more-is-merrier theory when it comes to mascot success. It helps, of course, that the Flyers and the Wings have the same owners. Gritty and Wingston are corporate cousins. So how did the Wings come up with this new guy? The Wings offered much the same setup as the unveilings of Franklin, Phang and Gritty: They got a bunch of schoolkids out of class knowing they’d scream for whatever was in front of them. And it worked! I now know one thing about Friends Select students, and it’s that that they love Wingston. And Gritty. And all the mascots, really. But mainly Gritty. Were there even other mascots there today? The kids love Gritty. Gritty is above the law. Gritty is all. Gritty will consume the universe. Gritty is entropy. Gritty is our past, present and future. Gritty. Gritty. Gritty. Gritty. Gritty. Gritty. Gritty. Gritty. Gritty. Gritty. Gritty. Gritty. Gritty. Gritty.